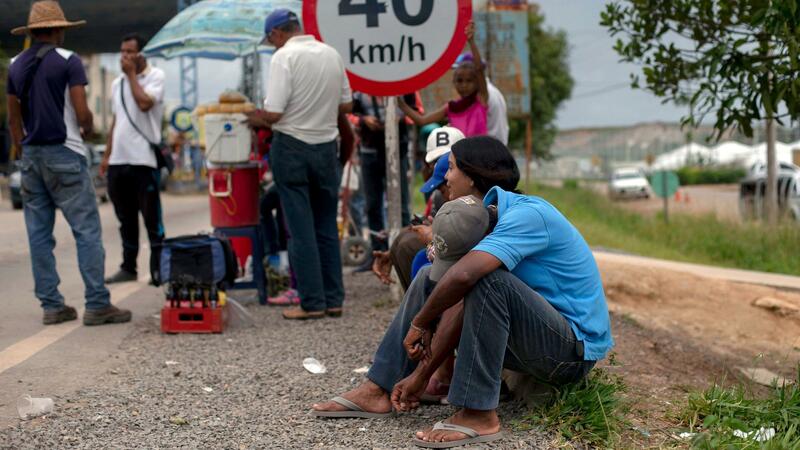 Venezuelan refugees wait outside the Brazilian Immigration Point in the border city of Pacaraima, Roraima, Brazil, on Aug. 20. Brazil's president said armed forces would be sent to the area. Temer said the armed forces are being sent to "guarantee law and order" as Venezuela's migrant crisis was "threatening the harmony of the whole continent." He said the move was for the safety of both Brazilian citizens and Venezuelan migrants. The decree is in effect until Sept. 12. Temer said on Twitter that Brazil was working to minimize "the impacts of the humanitarian disaster caused by the government of Venezuela." He said Tuesday that Venezuelans have been subjected to "terrible living conditions." Earlier this month, Brazilian residents at Roraima's border town of Pacaraima attacked migrant camps of Venezuelans, according to The New York Times. In Venezuela, inflation rates recently topped 60,000 percent amid widespread reports of food and medicine shortages. More than 1.6 million Venezuelans have left the country since 2015, the United Nations said, with 90 percent of them moving to other South American countries — especially Brazil, Colombia, Peru and Ecuador. A total of between 2,700 to 4,000 migrants arrive in those four countries each day, the U.N. says. In Brazil alone, more than 800 Venezuelans have arrived each day as of April, the U.N. said, with a total of more than 52,000 since the start of 2017. Brazil's announcement comes after a meeting this week of officials from Ecuador, Peru, Colombia and Brazil in the Colombian capital Bogota over the handling of what a U.N. refugee official has characterized as "one of Latin America's largest mass-population movements in history." Colombia is now home to about 1 million Venezuelans while more than 400,000 are living in Peru, Reuters reported. Colombia and Peru announced that they would begin sharing information on Venezuelan migrants in an effort to track movements and distribute aid, according to the wire service. Ecuador has declared a state of emergency in some of its northern provinces in response to the influx, while Reuters reports that Peru declared a 60-day health emergency Tuesday in two of its northern border provinces. Peru reported a decrease in the number of Venezuelan migrants entering the country after it imposed new requirements that went into effect Saturday — Venezuelan citizens must carry a passport to enter. Peru and Ecuador both made the change this month, requiring passports instead of national ID cards.